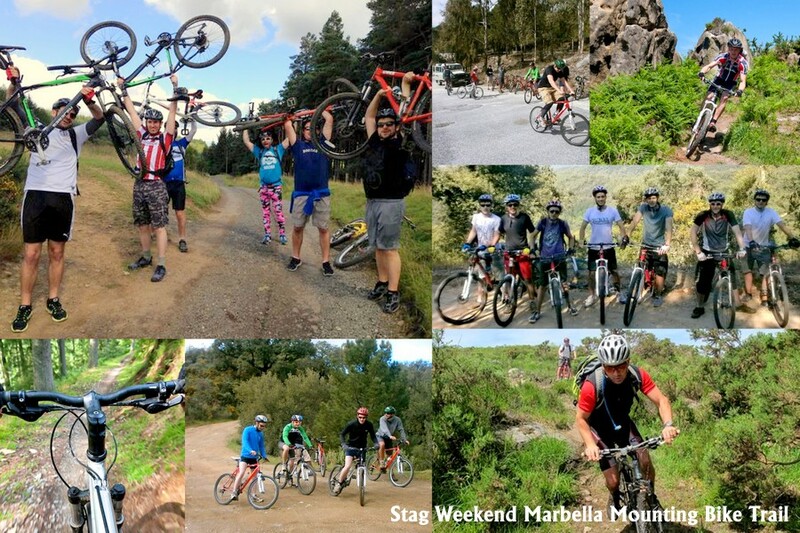 Stag party weekends in Marbella can enjoy Mountain biking, it's a great activity for Stag groups looking for some adrenaline and excitement whilst on the Costa del Sol. You will experience fresh mountain air and the adrenalin thrill of embarking on our stag cycling tour. Modern rugged bikes and a trek through the Marbella Mountains, stunning biking terrain that's exciting and a real must for your Stag Party Planners to consider. As a Stag group activity in Marbella it is up there among the best, it’s going to be a physical, challenging it's only when you're hurtling down a trail second guessing if you're going to make the next bend a smile spreads right across your dusty face and you wonder why you ever stopped riding a bike for fun! Hitting speeds on a mountain bike with a touch of danger. Our mountain biking for your stag group whilst here in Marbella will be a thrill, enjoying and a great memory and not forgetting a great work out as you hit the trails with your mountain bike guide. Mountain bike rides are spectacular, they test the endurance and stamina for every member of your Stag Party Group. We are the number one company in Stag Weekends activities and management on the Costa del Sol. Competitive with the quality and service you would expect from a very well oiled and experience team.